Chapman’s Bay Estate is a unique, low-density, security estate set up against a private bay. The estate offers spacious homes with spectacular bay and Table Mountain views. It boasts being eco-friendly and one of the most secure estates in the surrounding area. In order to maintain this harmony and serenity, it was necessary to ensure that homeowners and their properties are thoroughly protected. The only way to achieve this is through the deployment of an advanced security system supported by cutting-edge products. Accomplishing this involved dealing with a number of security concerns, including the vast perimeter of the estate. An effective early-warning detection system is of the utmost importance to be able to detect and respond to a range of possible threats from the neighbouring mountain. Innoza Group, the security system integrator for Chapman’s Bay Estate, selected Axis thermal network cameras to overcome the challenge of providing a surveillance solution within a completely dark environment. The estate required the use of smart analytics for detection and the ability to send out alerts, if an intruder was detected. Another important requirement was minimal false alarms. Axis was the clear solutions provider of choice on this front as well because it offers one of the most advanced perimeter defences managed by analytical software, the Axis Perimeter Defender. According to the Innoza Group, Axis also offers a much more user friendly experience to the end-user. “The Axis thermal cameras are an integral part of our security measures because they helped make a challenging installation simple, whilst providing the Rolls-Royce in surveillance systems, quality products and user friendliness at the same time. This culminated in a very effective perimeter defender and analytics setup that delivered very little false alarms and no perimeter breaches,” says Daniel Van De Venter, managing director at Innoza Group. Today, the absence of illumination no longer hinders the detection and apprehension of intruders. In addition, residents of Chapman’s Bay Estate can enjoy the peacefulness and splendour of their bay-side vistas, without the potential threat of security-related incidents. Since the installation of this state-of-the- art surveillance system, there have been no incidents or breaches of the perimeter. A total of 22 thermal cameras were used, with each one overlapping another to ensure the whole perimeter was covered with no blind spots. The Axis Q1941-E thermal camera is able to reliably detect and provide fast verification of each situation on the perimeter. Since thermal cameras do not need a light source, they can achieve higher accuracy and fewer false alarms than conventional cameras in most applications. Supporting Axis’ Zipstream technology, the Q1941-E filters out those areas with no motion, and it can focus on the parts of the image that are moving. This significantly reduces the bandwidth and storage required. 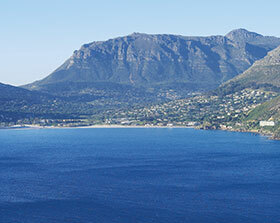 This is crucial because the Chapman’s Bay Estate site is monitored on- and off site. The security guards on site use the system and then there is another off-site monitoring company that monitors and responds to incidents. The footage is stored on a local- and off-site server. A thermal camera is mainly used for video analytics and detection in areas where no-one should trespass or walk around. Based on this premise, the video shows no image unless an intruder is detected. Furthermore, a PTZ (pan, tilt, zoom) camera was fitted at the highest point of the estate to be able to react to alerts and provide visual support for guards patrolling the area. Innoza Group selected the AXIS Q6115 due to its high-performance PTZ dome, offering 1080p resolution, 30X optical zoom, and fast and precise pan/tilt performance for wide area coverage and great detail when zooming in. The Sharpdome technology of the Q6115 includes Axis’ Speed Dry function that will help to provide sharp images in rainy weather. Moreover, it can also simplify dome cleaning, allowing for more efficient methods, such as high-pressure cleaning. This camera sports IP66-rated protection against dust and strong water jets, and is weatherproof with built-in protection against dust, rain, snow and sunlight (IP66- and NEMA 4X-rated), and impact resistance (IK 08-rated). Additionally, the camera is further protected with shock detection, a capability that sends an alarm in the event of attempted vandalism or prospective intruders tampering with the system. There are already plans to expand the surveillance security system. The estate will add more IP cameras to cover risk areas internally once the construction phase is complete. Additionally, there are also other sites planned for similar installations. Innoza Group is going to a world renowned estate in George soon to finalise another solution.